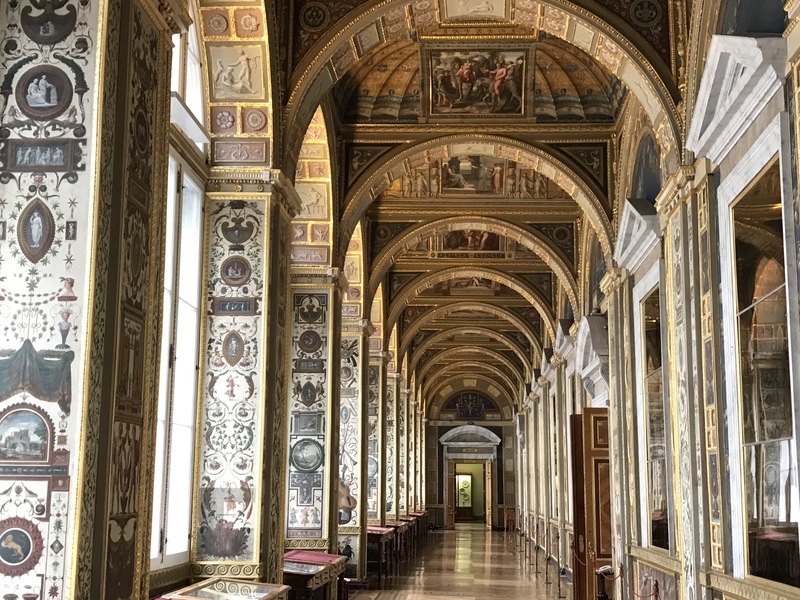 It has been variously said that even if you stood in front of each Hermitage Museum object a few seconds less than a minute you’d need a total of eleven continuous years, day and night, 24/7, to see everything – at least 3.5 million objects or monuments to art and culture”  – on display in St. Petersburg including the Winter Palace and four adjoining buildings as well as the Hermitage Annex a few miles away that we also visited. That doesn’t even cover the material not on display, whose inventory may double the collection. Empress Catherine II the Great (1729-96) began assembling her collection in 1764 with the acquisition of 225 Old Masters paintings and the collecting seemingly never stopped in her reign and her successors continued adding to collections for centuries. 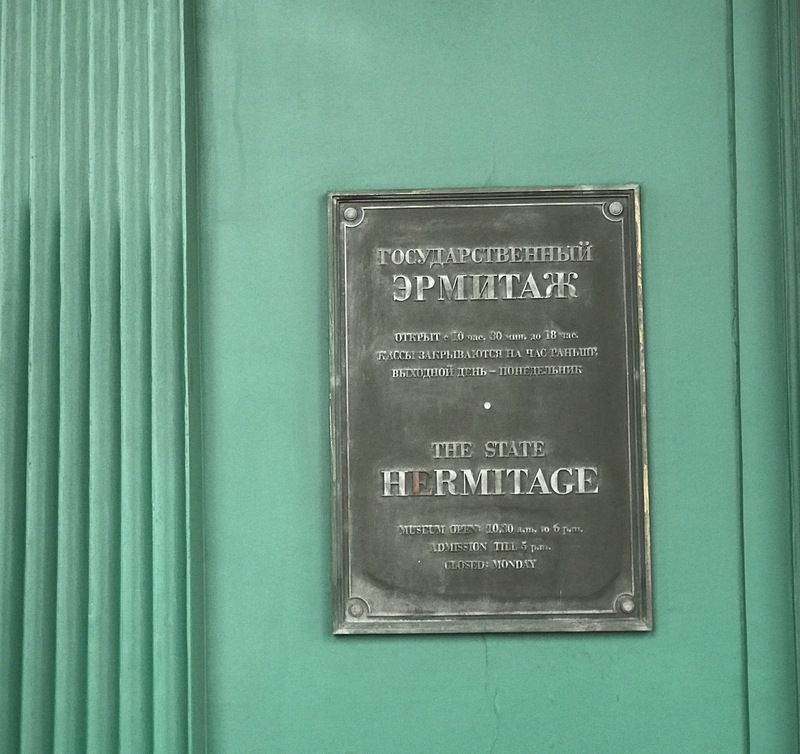 Recently in Russia, I spent a week in St. Petersburg this past September and we were in the Hermitage four separate days. My favorite Hermitage collections are the incredible Rembrandt paintings – more than a dozen – in the Rembrandt Gallery, the pair of Leonardo da Vinci paintings, the Impressionists collection, the Imperial jewelry collection, the Renaissance Maiolica collection, the Raphael Loggia, the Scythian antiquities, the Roman and Greek antiquities, the micro-mosaic collection, the huge amount of mineral vases made from malachite, breccia and rhodolite, but also the vast Winter Palace square architecture and massive scale of the almost countless galleries are staggering in themselves, whether in the volume of real gold gildings or incredible wood parquet floors. Sometimes with so much beauty both above you on ceilings and below your feet vying with the objects in the rooms, it’s almost overwhelming. You become well aware you can’t see everything in one week. I think my favorite Rembrandt painting here was his late canvas Return of the Prodigal Son, ca. 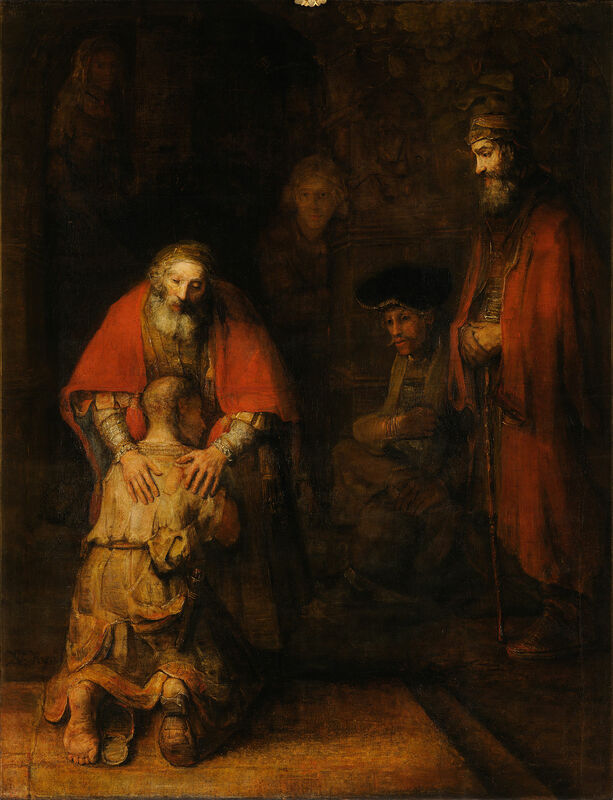 1665, depicting a biblical parable from Luke 15 where the father’s loving hands on his ragged son’s back may well be the most tender hands in all art, so inclusive and depicting the love and forgiveness of the father for his son just returned from a terribly wasted life, having spent all his inheritance and unworthily returned as a beggar in his own eyes; the father welcomes him home having waited for him every day for years. Of course, the elder judgmental brother – one of the two debated persons on the right – is not so forgiving, selfishly bitter that his father’s love is not solely his. He feels his brother doesn’t deserve any love whatsoever and his prodigal brother seems to feel the same way because he asked his father to accept him on the same status as a servant, not a son any more. Rembrandt’s genius shows how the compassionate father’s embracing arms and gentle hands are a protective love around his returned son. Clearly Rembrandt knew and loved this parable. I waited my whole life to see this painting, having seen it for years in books but never before able to stand in front of its large canvas (almost nine feet by seven feet). One of the curious things about this painting is that Rembrandt painted it near the end of his life when his paintings were not wanted any more and his commissions mostly dried up. Some say he seems to have painted this Return of the Prodigal Son for himself with no requested commission. It was worth the wait for me to see this and other Rembrandt paintings along with the other almost countless masterpieces in the Hermitage. 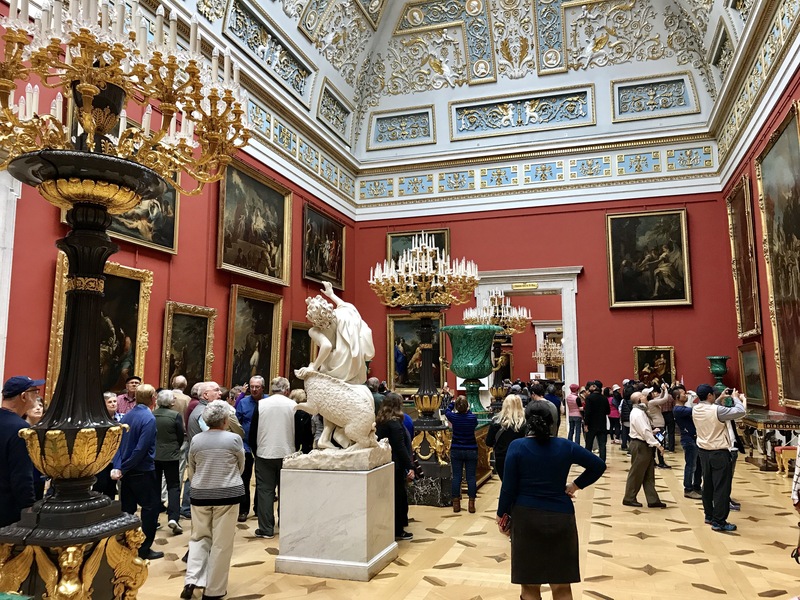 With so many priceless works of art collected over three centuries in this world class museum, it was a once in a lifetime opportunity to visit Russia and see such world heritage. 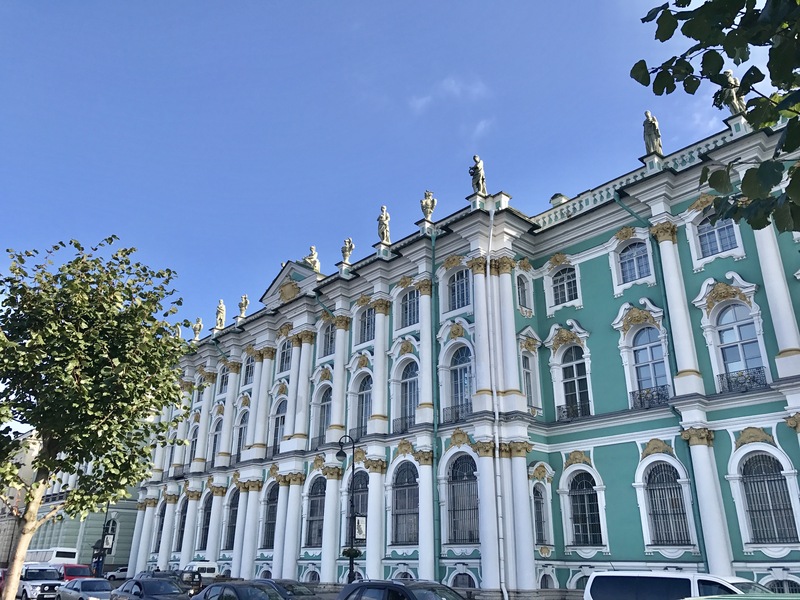 Whether one sees it from the Palace Square, or from the water – we also approached it on a twilight cruise lit up and by midday ferry from the Peterhof – the Hermitage is certainly one of the most arresting architectural wonders of St. Petersburg and Russia. I look forward to visiting it again and exploring its treasures. The Hermitage Masterpieces of the Painting Collections: . St. Petersburg: Slavia Publishers & London: Scala Publishers, 2004, 8.